Sephora is every makeup lovers dream, it’s the one place we get to release our inner makeup addict and go crazy swatching things, filling our baskets up with new products and of course those addictive little minis by the till that you have to buy because they look so cute. When we booked to go to New York I must admit visiting Sephora was one of the things I was most excited for so to say I’ve finally walked through those doors feels like an achievement I need some kind of an award for, or at least a sticker. Whilst we do have some decent stores that sell makeup in the UK, nothing will ever compare to Sephora. With the huge variety of brands available (especially the brands we can’t get easily in the UK!) means that no trip to a place that has Sephora is complete without at least 75 trips during your stay – an entire store dedicated to makeup, skincare, fragrance and all things beauty really is magical. I ended up going to a few different Sephora’s whilst I was in NYC because you can’t walk past and not go in, so I made the most of it and went on a bit of a spend up! The first bits I picked up were base products. Before we left I had a big sort out of my makeup collection and I realised I didn’t actually need anymore foundations but somehow I’ve come back with 6, I know I’m weak but 5 of them are from the drugstore so I’m justifying it by the fact they were more affordable. I wasn’t sure which highend foundation I was going to go for and I was torn between a few but after having a little play around with the formulas and shades I went for the Kat Von D Lock It Tattoo Foundation. The one thing that really sold this to me was how smoothly the formula applied to the back of my hand, it smoothed out the fine lines so well and I was sold instantly. I’ve worn it once whilst I was in New York and I really liked it, it’s full coverage but not too heavy on the skin but I’ll get round to sharing a full review once I’ve tried it more. 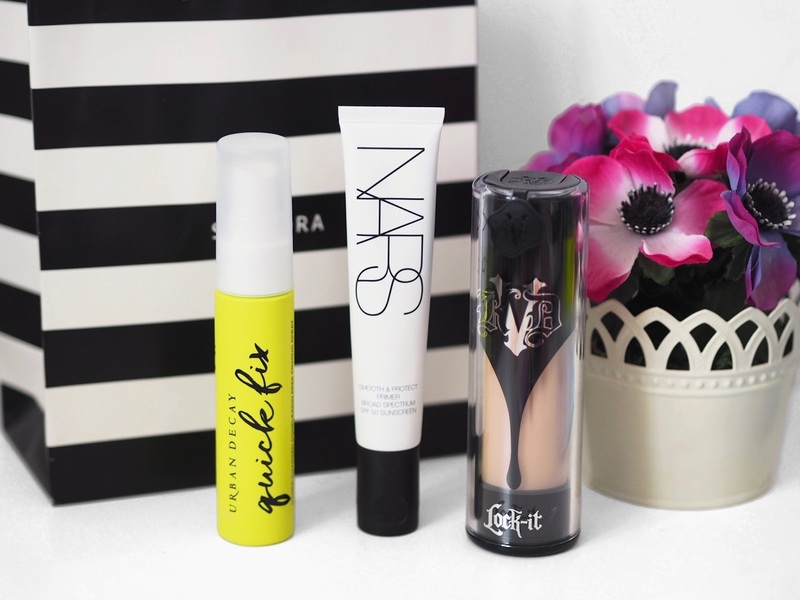 I then picked up two fairly newly released primers, the Urban Decay Quick Fix Hydracharged Priming Spray and the Nars Smooth & Protect Primer. I’ve been using both since I got them and I’ve been absolutely loving them! I love primer sprays and the UD Quick Fix might just be one of my new all time favourites, it’s one of the few I’ve found actually make a difference to my skin. The Nars primer is also a real gem, it smooths the skin so beautifully and I love how my foundation applies on top of it. One of the products I knew I wanted to pick up was one of the Hourglass Ambient Lighting Bronzers. 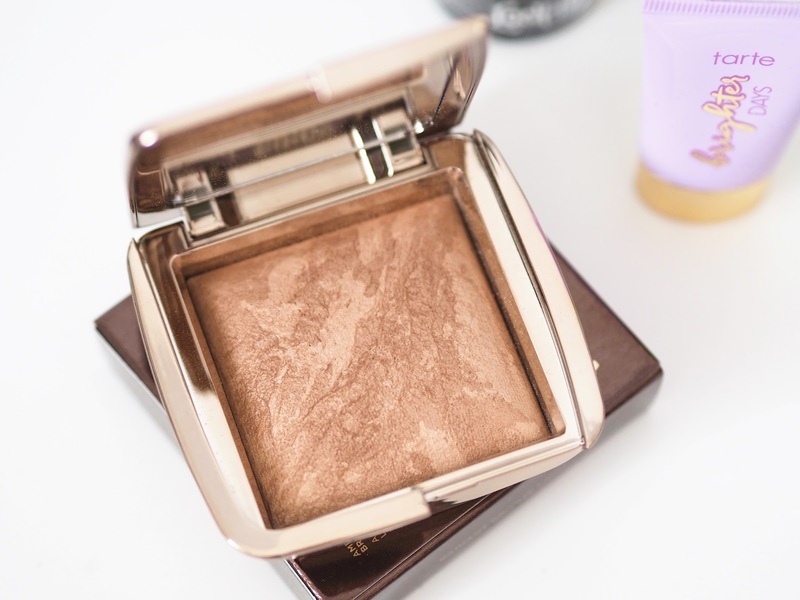 I’ve only recently delve into the world of Hourglass with one of their blushes and I’ve fallen in love, but I knew I wanted to get a bronzer in store as I wasn’t sure what colour to go for online. I actually ended up going for Radiant Bronze Light which was the darker of the two colours available in store as I found the lighter shade had a little too much shimmer running through it and I just preferred how this one looked when I swatched them next to each other. Whilst it’s a real treat coming with a $50 price tag, this really is something special. It’s so beautiful and I love the sun kissed glow it gives to the face without looking like I’ve been slapped in the face with a bronzer (what a glam way to put it). The powder sits so well on the skin, the colour works well with my skin tone and it’s just a little compact full of bronzed glowy goodness, I’m obsessed. Because you can’t go to Sephora and not pick up a sheet mask (or three) I bought the Lotus Face Mask which I used at the hotel when my skin was in desperate need of hydration and LOVED, the Lotus Eye Mask which I gave to mum to use and she loved (both aren’t pictured as we used them back in New York) and the Dr. Jart Pore Minimalist Charcoal Mask which I was a bit undecided on, I used it after the long flight once I’d got home but I just didn’t find it made a difference to my skin. 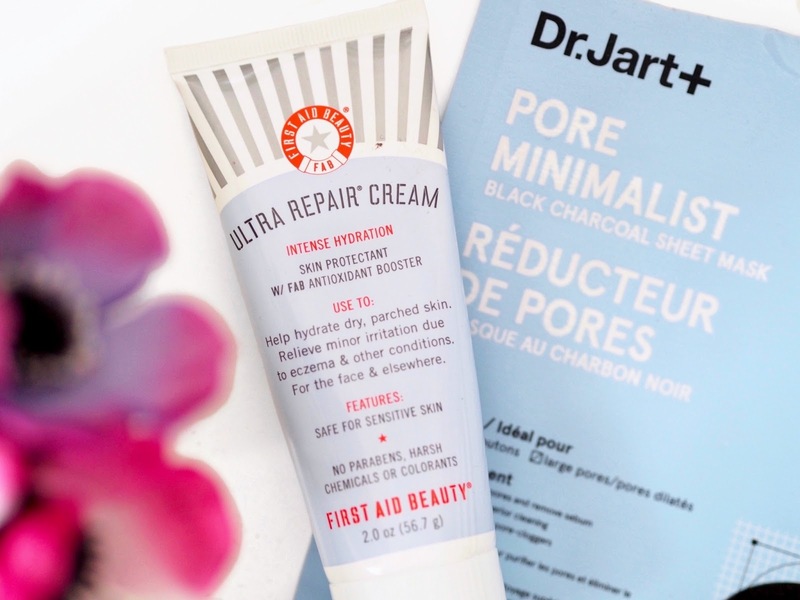 The only other skincare bit I bought was the First Aid Beauty Ultra Repair Cream. My sister was on the lookout for this and it wasn’t until I saw it by the till I thought I’d pick it up too. As I have combination skin I find whilst I do get oily on areas like my t-zone, I still need that hydration on other areas of my face especially after the travelling I’d done. I’ve been loving it so far, it hydrates without irritating my sensitive skin and it isn’t too heavy on my oilier areas. I’ll get round to sharing a review once I’ve given it more of a try. When I was paying I actually got to pick a free beauty gift as it was my birthday back in February and out of the various options I went for the little Tarte set. 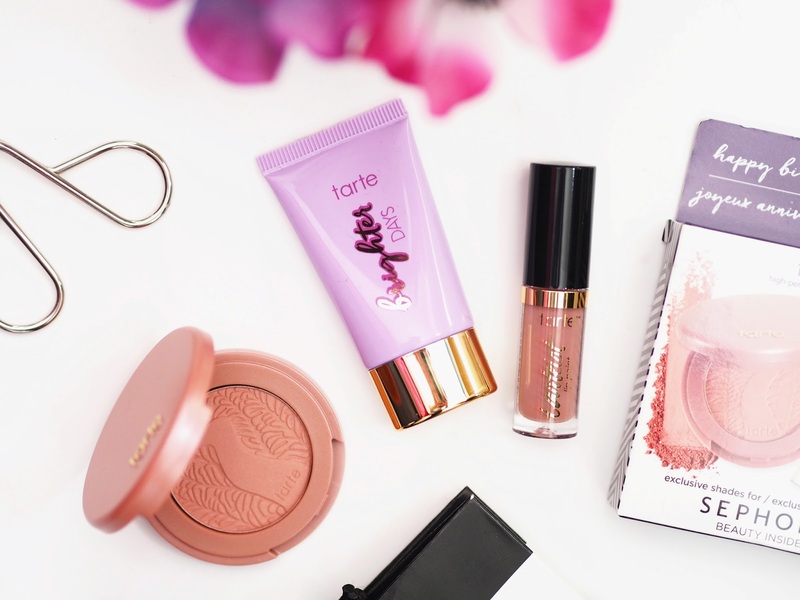 It comes with the Amazonian Clay 12 Hour Blush in Paaarty and the Tartiest Lip Paint in Birthday Suit, both of which are perfectly named. I also got a little sample of the Tarte Brighter Days Highlighting Moisturiser which I’m not entirely sure why, possibly because I spent over a certain amount as lets be real this haul wasn’t exactly budget friendly. 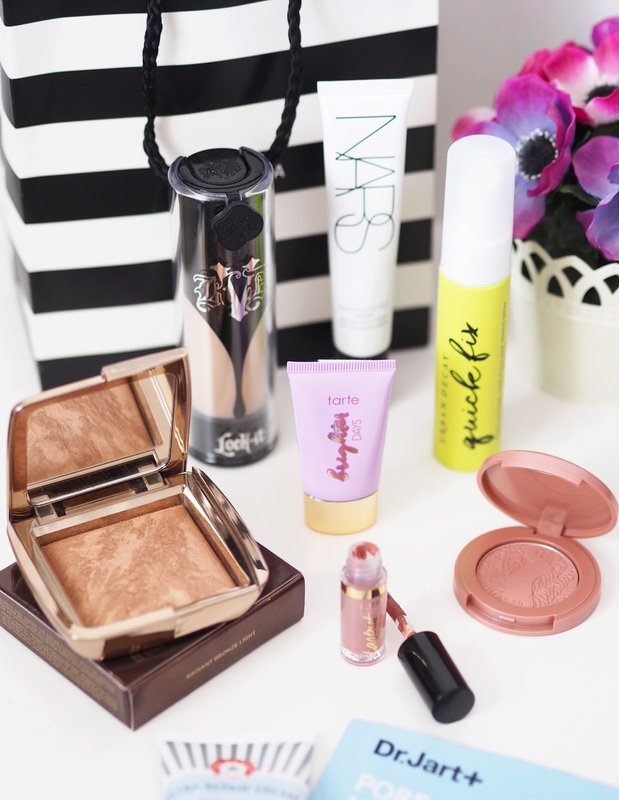 Miniature sized products are my absolute faves. So that’s everything I picked up in Sephora, I can’t wait to give everything a proper try now I’ve finally got round to taking the pictures! I’m still missing New York like crazy *sobs*.